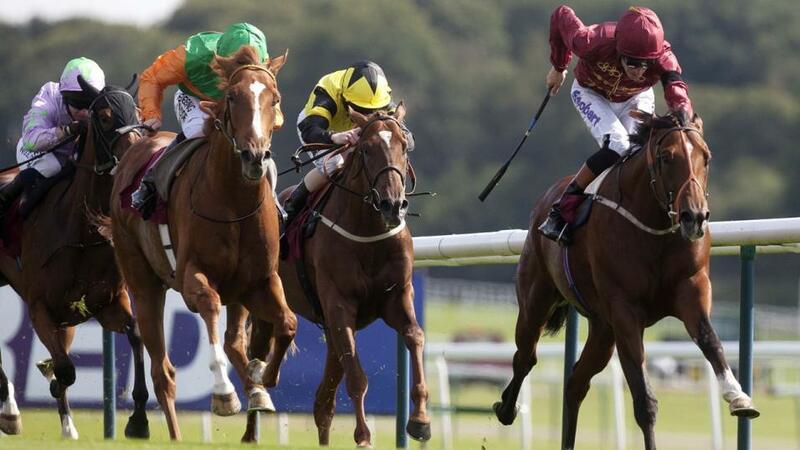 Timeform preview Sunday's Irish Lincolnshire Handicap and pick out their best bet. "...the type who could really take off now as a lightly-raced five-year-old..."
It is the start of the 2019 Flat season at Naas on Sunday, where the Irish Lincolnshire Handicap takes centre stage. One of Ireland's most prestigious handicaps, it looks a typically competitive renewal, with a maximum field of 20 runners set to go to post. The Jim Bolger-trained Theobald is one of the more fancied runners having been kept busy on the all-weather at Dundalk over the winter period. He has won his last two starts at that course, the latest in tenacious fashion in a mile and a quarter handicap, making all and holding on gamely all the way to the line. His record on the all-weather is very much a positive one now, but he is equally effective on turf, and it isn't a surprise to see him well fancied for this as he is able to race from the same mark returned to turf. The only concern would be his draw in 14, as it often pays to be drawn low over this C&D. Ger Lyons has done well in this race in the past and Karawaan looks an interesting acquisition for the yard having been bought from Sir Michael Stoute for £32,000 in August. Admittedly, Karawaan never reached his full potential, but he has shown on numerous occasions now that he possesses ability, and a change of scenery could perk him up. Even on the pick of his form, though, he should be competitive from a mark in the low-80s and, having been handed a nice draw in stall 3, a big run could be on the cards for Karawaan, who has run two of his best races to date when returning from a break of over 200 days. Lyons is also responsible for Tony The Gent, who is on a lengthy losing run, his last win coming in July 2017, but his recent efforts have been more encouraging, and he looks favourably treated on the pick of his form. He arrives fit having been kept going on the all-weather through the winter, and confirmed his return to form when finishing runner-up at Dundalk last time, racing from off the pace in a race where the winner made all. This claimer rode him several times last season so knows him pretty well and he could go well at bigger odds despite being 3 lb higher in the weights now. Master Speaker is another who has fallen to an attractive mark having run inconsistently for the most part of last season. He looked rusty on his first start for five months over an inadequate trip at Dundalk last month, racing in the rear after being hampered at the start and never able to get on terms with the principals. That spin ought to have blown the cobwebs away and he should feel the benefit here, this race likely to have been a long-term plan for his shrewd yard. Richard Fahey has long since been well represented at this meeting and he has three runners here in the shape of Calvados Spirit, Crownthorpe and Society Red. The best handicapped of the trio looks to be Calvados Spirit, and he has a good record when fresh too, but he hasn't fared so well with the draw which is of some concern. Crownthorpe is a generally consistent type who should give his running again but perhaps hasn't got much in hand from this mark. Society Red has the up-and-coming Connor Murtagh taking a valuable 5 lb off, but he is another who looks high enough in the handicap at present and may prove vulnerable from a win perspective. Marshall Jennings has made a winning reappearance over this C&D twice in the last three years and doesn't look badly treated despite having to shoulder top weight. Admittedly, he was disappointing on his sole start in this race in 2017, but he didn't have the best of draws that day and, although he hasn't fared too much better this time around, his effectiveness at this track needs taking into account. One who is really on the progressive path now is Ciao, having shown much improved form to win two of her last three starts at Dundalk. Both of those wins have come over a mile and a quarter, but she has been ridden prominently on both occasions and you do need to stay well to win over this C&D. She runs under a 7 lb penalty now in a much deeper race, which makes life more difficult, but she could yet have more to offer, and it would be folly to ignore her claims. In summary, you could make a case for several in what looks another very open renewal, but preference is for Karawaan. He has the right sort of profile for a race of this nature, still relatively unexposed and at the right end of the handicap, the type who could really take off now as a lightly-raced five-year-old. Furthermore, he has joined a yard that are very adept with new recruits and know what it takes to win this race.